If you love exploring or planning a vacation, a digital camera will help, you bring back images that stand the test of time. These cameras enable you to share beautiful memories with your friends and family for years to come. The best digital cameras for traveling are also a perfect choice for creative individuals. These cameras enable you to create your own photographic imagery, which can be a tremendous boon to your creative work. Back in 1900, Eastman Kodak unveiled the first ever Brownie camera. While it had a basic design, it was revolutionary in democratizing photography. During those days, purchasing a camera was easy. Fast-paced, more than a century later, we have modern cameras that are very advanced and diverse. This makes selecting the best camera for travel confusing. To make it hard we have the inbuilt cameras in our Smartphone. However, if you are planning to make the most of your vacation you need a dedicated digital camera. So, what is the best digital camera for traveling? Well, there is no easy answer to this question. This is because different individuals have different budgets and requirements. Our goal is to help you narrow down the overwhelming choices available on the market and pick the perfect travel camera for your next trip. If you don’t believe that great things come in small packages, meet the Kodak PIXPRO S-1 camera. Boasting of a compact and lightweight design, you can now unleash your creativity and capture every moment wherever your adventure takes you. Featuring a slip body coupled with advanced functionality, this camera produce crystal clear images with razor-sharp details. The 4fps multi-burst, wireless connectivity and 3 inches articulating LCD are just a few of the features that make this camera stand out from the rest. Featuring an advanced CMOS sensor that has 16MP, you will get more speed and clarity than its predecessor that had a CCD sensor. The camera also helps you to save your images in both RAW and JPEG file format making it possible to keep every Pixel at the highest quality and detail. Above all, this high-speed action camera lets you capture 1080 Full HD videos at a touch of a button. 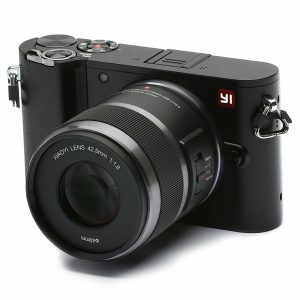 Innovative, Minimalist and versatile, the Y1 M1 Mirrorless digital camera is designed to deliver spectacular image quality thanks to its advanced image sensor. Boasting of interchangeable lens, this camera offers you superior quality shots through 20MP still images and 30fps/4K videos. The camera comes with Wifi and Bluetooth connectivity that connects to the Y1 Mirrorless app that allows you to download, view, share and shoot pictures remotely. This camera comes with two lens options as well as an MFT mount option that is compatible with over fifty interchangeable lenses. In addition, you will get to enjoy using the 3-inch touchscreen LCD and intuitive interface that makes it easy to use. The camera lightweight and compact design also allow you to take it anywhere. Besides delivering phenomenal 4K video quality, this camera also captures incredibly clear and crisp still images. While the Smartphones may have shrunk the digital camera market to a fraction, the presence of high-quality cameras such as COMITECH Digital camera proves there are still good reasons for owning a digital camera. This innovative Vlogging camera allows for clear image shooting at impressive 24.0MP and video recording up to 2.7K this camcorder is also designed to perform well in all lighting conditions including low-lit areas. To facilitate this, you can choose to use the popup front flash to illuminate the area or adjust the ISO Setting for you to record in a dark environment. Sharing is also made easier with this digital camera. Taking pride in its inbuilt Wifi connectivity, you cannot only share the videos and images easily with friends but also enables remote view. By downloading the PPShow APP by scanning the QR code on the user manual, you can also turn your Smartphone into a real-time remote control. Besides, the camera also comes with a rotating screen allowing you to take selfies. 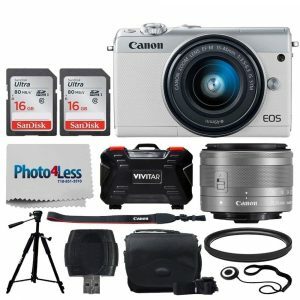 Over time, Canon has perfected their art when it comes to making Mirrorless digital camera. With Canon EOS M100 camera being their latest entrant, you can be sure to find great features in this model. It comes in a compact, lightweight design making it a great companion for people who loves traveling. 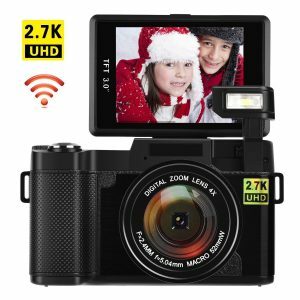 Unlike its predecessor, this camera comes with built-in Wifi, Bluetooth, and NFC making it easy to share your images immediately after you take them. We love the advanced 24.2MP APS-C sensor that allows you to capture high-quality images and videos instantly. This is a great choice for beginners who are looking to step up their photography skills. This is made possible by a creative assist feature that walks you through various settings and how they affect the image quality. Moreover, thanks to the tilting touchscreen LCD, it is easy to capture your grand adventure with friends and family easily. Capture memorable moment with the ultra-fast auto-focusing Sony a5100 camera. Coming in a lightweight and compact design, this camera lets you take beautiful images all the time. Even on low light, this camera delivers 23.3 of details and lets you share the photos thanks to the inbuilt Wifi connectivity. The camera also comes with a tiltable screen that lets you take selfies. Thanks to the APS HD CMOS sensor, you will also get incredible details and gorgeous enlargements. Another incredible feature is the higher resolution. Different from other models this model comes with gapless on-chip lenses that deliver ultimate image quality. With superb moving object tracking, this camera also helps you make great shots of a moving subject. Additionally, you will love the Wi-Fi connectivity that enables you to share your videos and images effortlessly. Besides, this model comes with a tiltable LCD screen that flips up to 180 degrees. This makes it incredibly easy to take selfies. Boasting of 20.1MP Super HAD CCD Sensor you can capture gorgeous images with superb clarity and clarity to the finest details. 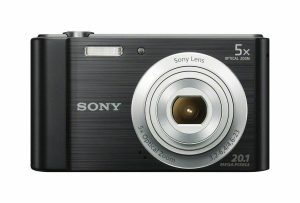 The Sony DSCW800/B camera lets you get up-close to the action with fiveX optical zoom. In addition, you get to enjoy the benefits of a steady shot image stabilization that delivers sharp image quality with minimal blur. With this camera, you can also reach beyond the traditional camera to take more breathtaking shots thanks to the panorama modes. With this feature, you simply need to press the shutter button and swipe the camera to your desired direction. This will enable you to make continuous shots at high speed to create a beautiful panoramic image. Additionally, this unit also comes with an inbuilt instruction guide. This allows you to search the camera’s functions to suit your needs. 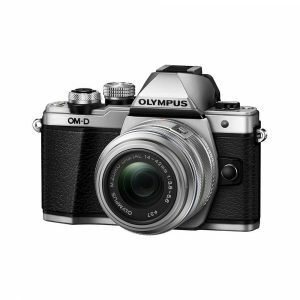 The Olympus OM-D E-M10 Mark II boasts of a sophisticated design with intuitive controls, making it a joy to use for both professionals and beginners. It comes with a compact profile and intuitive controls that ensures faultlessness with every shot. The 8.5 sequential burst function is designed to works hand in hand with its fast autofocus to capture fast-paced moving objects without blurring. It also comes with OLED Electronic Viewfinder, which performs a better job when compared to LCD monitors. With 2.36 MP this viewfinder will enable you to capture what you want easily even in bright light. Life moves fast and this camera is designed to keep up. Thanks to the Touch autofocus, you can focus and release the shutter by simply tapping the area you want to zero in on. Additionally, this camera comes with built-in Wifi connectivity as well as Olympus image share apps that lets you share your videos and images with friends and family easily. 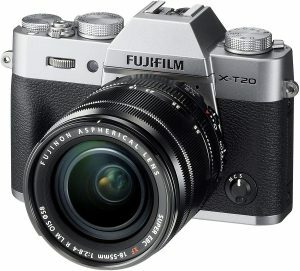 Coming in a lightweight and compact design, the Fujifilm X-T20 digital camera comes with an advanced processor and sensor to offer better image and video quality. This camera comes with an enhanced video functionality that is capable of capturing 4K videos. It also comes with intuitive dial-based controls that let you capture the images exactly how you want to see them. Boasting of advanced features, this camera will also allow you to capture beautiful images wherever you are. It comes with a 2.36M dot El electronic viewfinder allowing you to shoot in bright light easily. Additionally, this unit also comes with four dedicated lens element that allows for a clear and high-resolution image. What’s more, this camera also features a 24.5 APS –C sized sensor that delivers outstanding image quality. 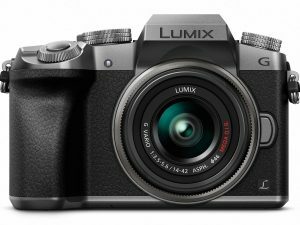 The revolutionary PANASONIC LUMIX G7 camera comes with twenty-four compact lens options. This is made possible by the Micro four third systems that are compatible with various lenses. 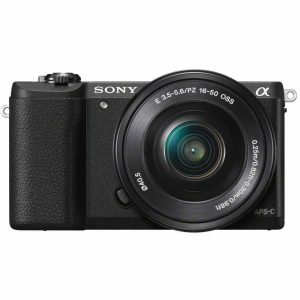 It comes with a Mirrorless design that is lighter, compact whole offering innovative technology. This facilitates better performance in terms of image quality, control, as well as wireless connectivity. Boasting of exclusive Lumix 4K ultra HD video pause you can perfectly capture a scene easily. This camera comes with a 16MP sensor coupled with the next-generation intelligent image processor. This enables it to produce videos and photos that are free from artifacts that interfere with the image quality. We also love the retro modern design which is lighter and compact but still offers intuitive controls. What’s more, this unit comes with intelligent autofocusing that helps track the size, color, and motion vector of a subject. This enables you to shoot with confidence without having to worry about blurry results. 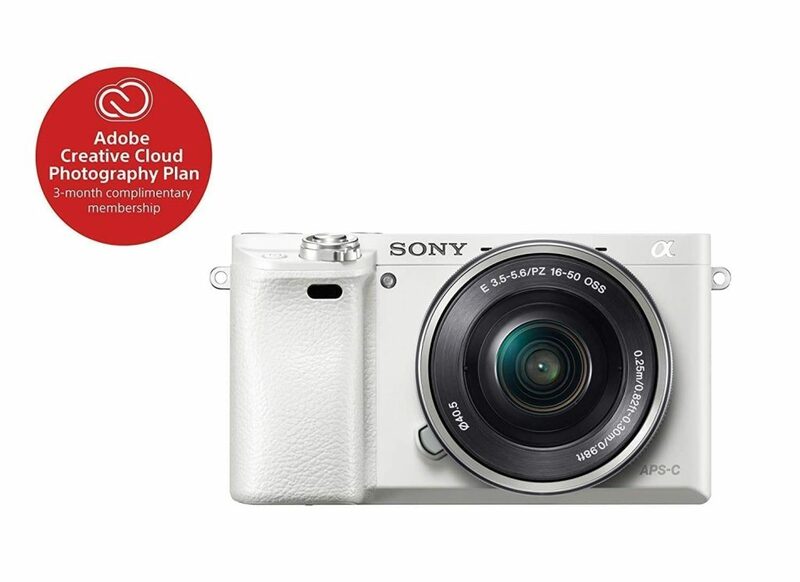 It is time to test the limit of your creativity with the Sony Alpha a6000 Mirrorless Camera. Being focused on speed, every artistic shot you take will benefit from the superior 24.3MP sensors and fast autofocus. With this model, you can capture the crucial moments that go in a blink thanks to its ability to shoot up to 11 photos in a second. This camera is also compact and easy to use too. Boasting of the New BIONZX image processor, this camera also reproduces high-quality textures and details in real life. This is facilitated by the high-speed processing that delivers true to life images. Additionally, this camera has 20 percent higher sensitivity that lets you get stunning detail even in low light. Besides the additional burst of light, this unit also comes with pop up flash as well as a standard hot shoe for additional flash accessories. What’s more, sharing is made easier thanks to the inbuilt Wifi connectivity. When choosing a perfect travel digital camera, it is crucial to understand that these cameras come with different features that affect their performance. Below are some of the crucial features that you should consider before settling on the best model. Contrary to what people used to believe a couple of decades back, a bigger camera doesn’t mean it offers better results. Similar to other equipment that you need for traveling, you need something that is compact and lightweight. Of course, you don’t need something that will bog you down when hiking or camping. Despite the compact design, you should also ensure that the camera also offers you with intuitive controls. This will enable you to make perfect shots easily. Another common misconception is that cameras with more megapixels are always better. While this plays a part in ensuring the quality of the images, you should also look at the sensor. We recommend going for models with decently sized sensors as it offers you higher detail at the same time allowing you to crop the image without reducing its quality. Another feature to look at is the lens aperture. As a rule of thumb, lower aperture number performs better in low light situations. Another crucial feature to consider is the zoom range. The zoom range will get you closer to the action. Bigger zooms make a camera bulky. For this reason, it’s a matter of personal preference. Additionally, you should also look at the video quality. The best models should allow you to shoot video in 1080p HD with the latest models having 4K capabilities. Last but not least, you also need to consider a model with Wifi or Bluetooth connectivity. This will help you upload the images to your Smartphone instantly or share with your friends. Remember, even if having the best camera doesn’t make you a pro, it plays a crucial role. Of course, you cannot make glamorous shots if you are using an outdated camera. With any of the following digital cameras, you can make shots like a pro without any experience. Additionally, you should also take your time to learn new photography skills to get the best out of any of the cameras you choose. Good Luck!